You will Receive 5 Belly Button Rings Trendy Dangle Designs.Each order comes with Gift Box and JOVIVI Velvet Pouch! 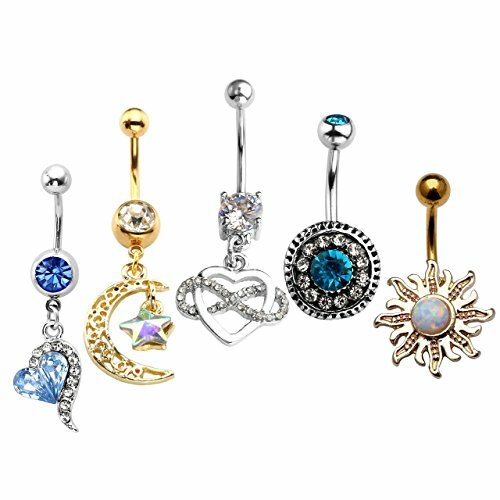 These dangle belly rings are sure to accentuate your belly and catch attention to your midriff. They are very secure, bright in color, and fun to wear! They are adorned with beautiful CZ stones and many different dangle charm options. This set gives you multiple styles for many different looks and occasions. Made of Quality Stainless Steel Bar and Unique Alloy Charms and CZ Crystal, Healthy and Comfortable to Wear.